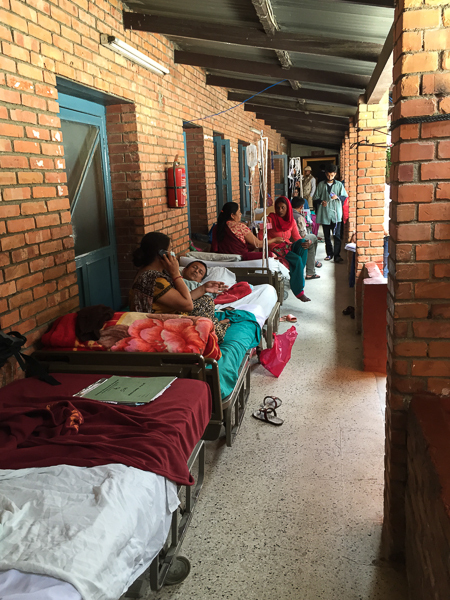 Part 7 of the May, 2015 Loma Linda University Health Orthopedic Team visit to Nepal. The following post was written by Andrew Haglund, logisitical supporter for our team. Andrew’s eyewitness account was also posted on CNN’s iReport. (This and subsequent updates from Nepal will be intermittent and delayed due to marginal internet access at SMH). The 40 some odd seconds during the magnitude 7.3 earthquake that struck here yesterday, were undeniably the most frightening of my life. No amount of preparation or even 42 years of Southern California shakers can prepare you for something quite like that. I’ve been here in Nepal for about a week now and was growing rather accustom to the frequent aftershocks, but it didn’t take long to realize this was different. 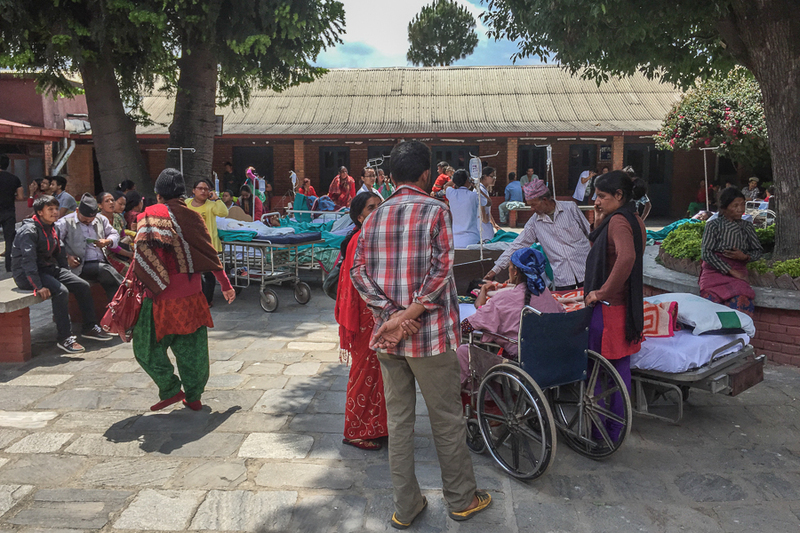 I am here in Nepal serving as logistical support for a small surgical team from Loma Linda University and Adventist Health International. Our team was assembled and deployed at the request of the Scheer Memorial Hospital administration based on our experience responding to the 2010 earthquake in Haiti at Hopital Adventist d’Haiti. 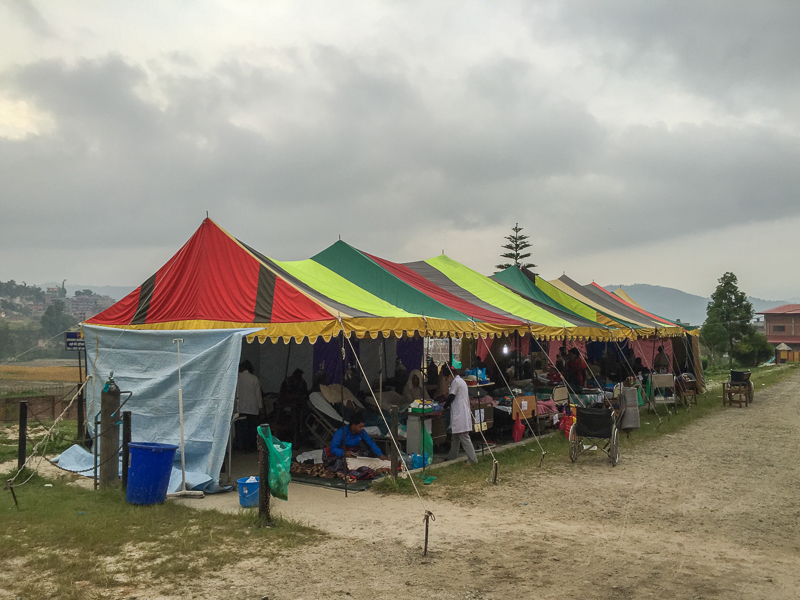 We arrived with 22 cases of surgical instruments, medical consumables, medications, and all of the other supplies needed to function as a surgical unit. Since our arrival our surgeons have been operating both here and in another hospital close by, while I have been working with the Scheer administration to improve disaster readiness, increase communications channels, and consult on future NGO partnerships for the longterm recovery. 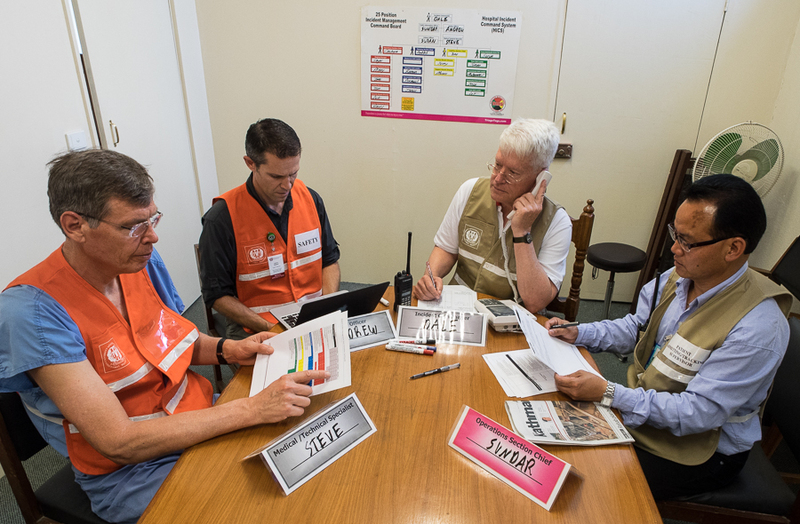 We had just completed a readiness exercise on hospital incident command with the Scheer administration in the 3rd floor conference room of the hospital. One of our team’s surgeons and I had decided to stay in the room for a few minutes to check emails on our laptops. When the room started to shake we instinctively locked eyes in an effort to force collective decision-making. Two other expatriate female mission workers were suddenly in the room with us. With few words shared the 4 of us sheltered in place for about 15 seconds, then the violence of the shaking increased. Again, with only a word or two exchanged we shifted for a doorway. The next few seconds presented an incredible set of choices, but when the shaking intensified yet again it was unanimous; “Okay, lets go”. Running past our shoes, we headed for the 3 flights of slick tile stairs in our socks. My mind was racing with thoughts of the previous day’s health cluster meeting where it was shared that it was the stairways that were “slicing” victims and should be avoided. We ran down those stairs with one thought in mind; get to open space. As we exited the hospital and regained our composure, it was imperative to get back to our objective of assistance. The noise was incredible, birds were screeching, dogs were barking and people were wailing. Patients, family members, doctors and staff, were streaming out of the hospital. 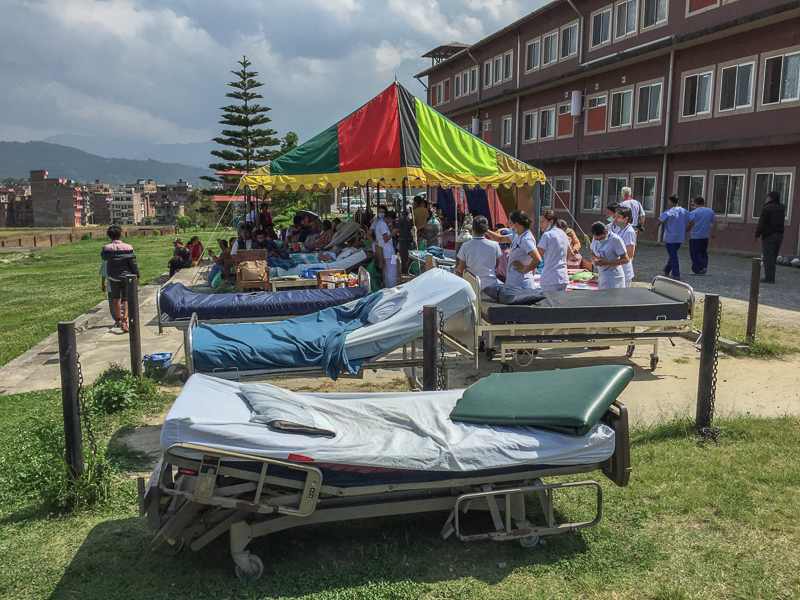 We spent the next few hours shifting basic hospital operations outside under tents, providing food, water, shelter, and as best possible, assurance that this too will pass. Pray incessantly for the people of Nepal.